Bidari-Zerehpoosh, F., Sharifi, G., Zahedifard, S., Soleimantabar, H., Ebrahimzadeh, K., Aghakhani, A. (2014). Bilateral Orbital Metastasis of Follicular Thyroid Carcinoma: a Rare Case Report. Iranian Journal of Pathology, 9(3), 229-233. Farahnaz Bidari-Zerehpoosh; Guive Sharifi; Sara Zahedifard; Hussein Soleimantabar; Kaveh Ebrahimzadeh; Arezoo Aghakhani. "Bilateral Orbital Metastasis of Follicular Thyroid Carcinoma: a Rare Case Report". 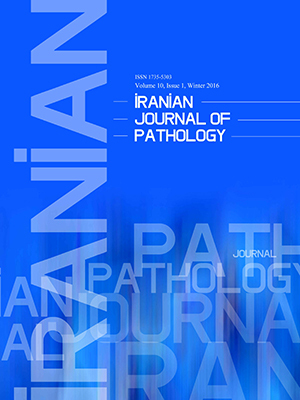 Iranian Journal of Pathology, 9, 3, 2014, 229-233. Bidari-Zerehpoosh, F., Sharifi, G., Zahedifard, S., Soleimantabar, H., Ebrahimzadeh, K., Aghakhani, A. (2014). 'Bilateral Orbital Metastasis of Follicular Thyroid Carcinoma: a Rare Case Report', Iranian Journal of Pathology, 9(3), pp. 229-233. Bidari-Zerehpoosh, F., Sharifi, G., Zahedifard, S., Soleimantabar, H., Ebrahimzadeh, K., Aghakhani, A. Bilateral Orbital Metastasis of Follicular Thyroid Carcinoma: a Rare Case Report. Iranian Journal of Pathology, 2014; 9(3): 229-233. Buandasan K, Hussein A. Follicular thyroid carcinoma mimicking meningioma: A case report. Asian Pac J Trop Med 2012; 1: 82-4. Kisakol G, Guney E, Kabalak T. Follicular thyroid carcinoma with late choroidal metastasis. Turkish J Endocrinol Metabolism 2002; 4: 155-7. Parlea L, Fahim L, Munoz D, Hanna A, Anderson J, Cusimano M, et al. Follicular carcinoma of the thyroid with aggressive metastatic behavior in a pregnant woman: Report of a case and review of the literature. Hormones 2006; 5(4):295-302. Ozdemir N, Senoglu M, Acar UD, Canda MS. Skull metastasis of follicular thyroid carcinoma. Acta Neurochir (Wien) 2004, 146: 1155-8. Anil S, Lal PM, Gill DS, Beena VT. Metastasis of thyroid carcinoma to the mandible. Case report. Aust Dent J 1999; 44: 56-7. Hefer T, Manor R, Zvi Joachims H, Groisman GM, Peled M, Gov-Ari E, et al. Metastatic follicular thyroid carcinoma to the maxilla. J Laryngol Otol 1998; 112: 69-72. Scarrow AM, Colina JL, Levy EI, Welch WC. Thyroid carcinoma with isolated spinal metastasis: case history and review of the literature. Clin Neurol Neurosurg 1999, 101: 245-8. Hornblass A, Kass LG, Reich R. Thyroid carcinoma metastatic to the orbit. Ophthalmology 1987; 94(8):1004-7. Betharia SM. Metastatic orbital carcinoma of thyroid. Indian J Ophthalmol 1985; 33(3):191-3. Daumerie C, De Potter P, Godfraind C, Rahier J, Jamar F, Squiffl et JP. Orbital metastasis as primary manifestation of thyroid carcinoma. Thyroid 2000; 10(2):189-92. Besic N, Luznik Z. Choroidal and orbital metastases from thyroid cancer. Thyroid 2013; 23(5):543-51. Amemiya T, Hayashida H, Dake Y. Metastatic orbital tumors in Japan: a review of literature. Ophthalmic Epidemiol 2002; 9(1):35-47. Basu S, Nair N, Aravind N. Unilateral proptosis with thyrotoxicosis resulting from solitary retroorbital soft tissue metastasis from follicular carcinoma thyroid. Clin Nucl Med 2001; 26(2):136-8.